Adult caregivers report higher levels of stress and depression and lower levels of satisfaction, vigor and life in general. Is 12 minutes of meditation the answer? Six months ago, researchers at UCLA published a study that showed using a specific type of yoga to engage in a brief, simple daily meditation reduced the stress levels of people who care for those stricken by Alzheimer’s and dementia. Now they know why. As previously reported, practicing a certain form of chanting yogic meditation for just 12 minutes daily for eight weeks led to a reduction in the biological mechanisms responsible for an increase in the immune system’s inflammation response. Inflammation, if constantly activated, can contribute to a multitude of chronic health problems. Reporting in the current online edition of the journal Psychoneuroendocrinology, Dr. Helen Lavretsky, senior author and a professor of psychiatry at the UCLA Semel Institute for Neuroscience and Human Behavior, and colleagues found in their work with 45 family dementia caregivers that 68 of their genes responded differently after Kirtan Kriya Meditation (KKM), resulting in reduced inflammation. Caregivers are the unsung heroes for their yeoman’s work in taking care of loved ones that have been stricken with Alzheimer’s and other forms of dementia, said Lavretsky, who also directs UCLA’s Late-Life Depression, Stress and Wellness Research Program. But caring for a frail or demented family member can be a significant life stressor. Older adult caregivers report higher levels of stress and depression and lower levels of satisfaction, vigor and life in general. Moreover, caregivers show higher levels of the biological markers of inflammation. Family members in particular are often considered to be at risk of stress-related disease and general health decline. As the U.S. population continues to age over the next two decades, Lavretsky noted, the prevalence of dementia and the number of family caregivers who provide support to these loved ones will increase dramatically. Currently, at least five million Americans provide care for someone with dementia. "We know that chronic stress places caregivers at a higher risk for developing depression," she said "On average, the incidence and prevalence of clinical depression in family dementia caregivers approaches 50 percent. Caregivers are also twice as likely to report high levels of emotional distress." What's more, many caregivers tend to be older themselves, leading to what Lavretsky calls an "impaired resilience" to stress and an increased rate of cardiovascular disease and mortality. Research has suggested for some time that psychosocial interventions like meditation reduce the adverse effects of caregiver stress on physical and mental health. However, the pathways by which such psychosocial interventions impact biological processes are poorly understood. In the study, the participants were randomized into two groups. The meditation group was taught the 12-minute yogic practice that included Kirtan Kriya, which was performed every day at the same time for eight weeks. "The goal of the study was to determine if meditation might alter the activity of inflammatory and antiviral proteins that shape immune cell gene expression," said Lavretsky. "Our analysis showed a reduced activity of those proteins linked directly to increased inflammation. "This is encouraging news. Caregivers often don’t have the time, energy, or contacts that could bring them a little relief from the stress of taking care of a loved one with dementia, so practicing a brief form of yogic meditation, which is easy to learn, is a useful too." Lavretsky is a member of UCLA’s recently launched Alzheimer's and Dementia Care Program, which provides comprehensive, coordinated care as well as resources and support to patients and their caregivers. 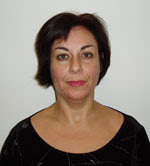 Lavretsky has incorporated yoga practice into the caregiver program.